Defensive driving is loosely defined as driving in a manner that strives to keep you in a good defensible position – allowing yourself time to react to unexpected hazards of all types on the road, and the techniques for how to react to those hazards. It is important to understand that defensive driving IS NOT the same thing as aggressive driving. Good defensive driving may call for aggressive driving at times, but they are certainly not the same. For example -Tailgating the vehicle in front of you would be considered aggressive; however it is definitely not a good defensive driving strategy. By doing so you have drastically reduced the reaction time you have should the car in front of you suddenly slam on the brakes, have a tire blowout, or countless other possible scenarios. Situational Awareness is probably the most important element to defensive driving. The sooner you perceive and assess a hazard, the better your chances are to react and avoid it. The single biggest piece of advice for this I can give is to avoid driving distracted. Put away the cell phone, or at least use a hands-free device! Second biggest tip – Scan the road’s horizon (the farthest point you can see on the road you are on.) When you are watching the road’s horizon your peripheral vision is much greater. This is where you are heading, and if there are hazards in the distance this is where you will see them first. Your eyes will still pick up on any sudden changes from the other vehicles nearer to you. Sometimes you will see evidence of a hazard before the actual threat itself. For example, when cars in the distance are all hitting the brakes, that is a sign there is likely something around that bend that you should be prepared for (this tip alone is a huge speeding ticket saver!). By using this method, there have been countless times where I have seen a hazard (whether it is a deer crossing the road or a patrol car on the shoulder of a freeway) long before the vehicles in front of me did. I have watched vehicles in front of me strike deer that I had spotted well before they did, and likely could easily have been avoided. In addition to the horizon, you should get into the habit of scanning your mirrors every 20-30 seconds. Even when you are not planning to change lanes or turn it is always good to be aware of the other vehicles around you. Should you need to make an emergency maneuver you will already know the best direction to swerve. Take note of how the other cars around you are behaving. Over time you will get good at anticipating what other cars are about to do. A very subtle swerve in their lane can be an indication they are looking to the side and about to change lanes, often without a signal. Suddenly closing up on the car in front of them is often a sign they are jockeying to change lanes directly in front of the car that is beside them, etc. As you learn to be aware of the vehicles around you, also keep in mind where their blind spots are. By doing this you can learn to avoid being in those spots, especially when you are anticipating them to change lanes. Also remember that as speed goes up, so should your awareness. The speed of your vehicle drastically affects your reaction time. The faster you are going the more focused you need to be. I won’t condone speeding, but I personally believe that when I get a speeding ticket that tells me I was not paying enough attention for the speed that I was going, and it serves as a relatively cheap reminder of what else I could have missed. Proper Posture & Ergonomics can play a surprisingly big role in maintaining awareness and in maintaining control of your vehicle during an evasive maneuver. By sitting upright with good posture, and how your seat is adjusted in relation to the steering column you can help avoid fatigue on long drives. Learning to properly brace your body in a fixed position with the vehicle, yet still allowing you to keep your pedal foot & arms relaxed and free to do their job controlling the vehicle is crucial. If your arms and pedal foot are also trying to brace you in a panic situation, you will jerk the wheel or mash the accelerator unintentionally when your reflexes are bracing for an impact. Consistently practicing proper bracing techniques (described below), while in your normal driving position will develop good habits that become second nature when reflexes kick in. Consistency in your driving position is also vital for learning just how much input your vehicle needs from you to maneuver a certain way, as well as to develop the feedback you get from the steering wheel, brake pedal, & vehicle’s suspension. Start with your seat. 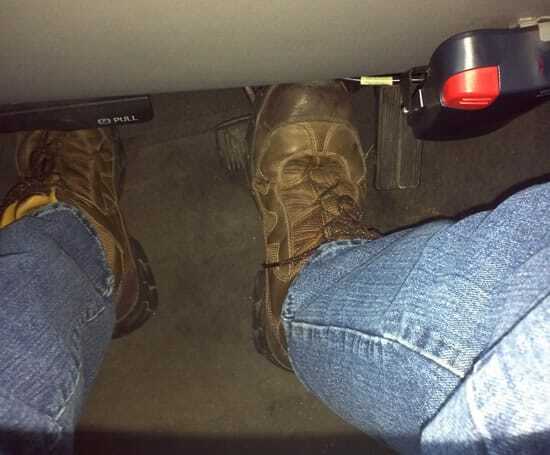 You should position you seat so that you are as far away from the steering wheel as you can get while still able to reach the pedals with the heel of your foot on the floor. You should also ensure that your arms can comfortably hold the steering wheel and reach the driving related controls on the dash. From this position you should adjust the mirrors so you can scan them easily without needing to lean your head forward or back. Adjust your mirrors to the new seat position if you notice you need to lean your head when checking them. You should wear your seatbelt. You should also be able to brace yourself firmly against the back of the seat by placing your left foot firmly on the lower back corner of the firewall (just beside the clutch with a manual transmission). When backing up, you should also be able to comfortably reach your right arm onto the back of the passenger seat as a lateral brace. These two bracing positions will give you a very positive and secure placement in your seat should you need to brace for an impact in either forward or reverse. They also keep your right foot and your arms free to control the vehicle. You will be surprised how stable your body is braced in this manner. This was the positioning I used quite successfully in a demolition derby. Demolition Derby cars typically do not use a 5 point harness because you require the ability to turn and see behind you, because the mirrors won’t last long! When backing up, learn to use your mirrors, but also get in the habit of turning and bracing in your seat as described above. It is good to be proficient with mirrors, and without – mirrors can get knocked off very easily. 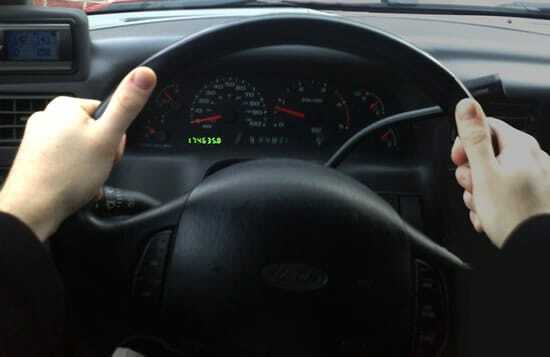 Learn to keep both hands on the steering wheel, close to the 10 and 2 positions on a clock. Learn to keep your thumbs OUT of the inside of the wheel. This is very important because hitting a curb, debris, or another vehicle, with the front tires will violently jerk the steering wheel. Broken thumbs are a common injury in off road and racing sports when thumbs are wrapped around a steering wheel. I like to place my thumbs up on the front/top side of the steering wheel. This position may also minimize the damage to your hands should your airbag deploy. When turning the steering wheel, practice using the same hand over hand technique consistently. This will develop good automatic muscle memory that is adept at accurately turning the wheel however much you need and quickly bringing it back to center. Position your right foot’s heel on the floor below the brake pedal and in a consistent position where you can comfortably use the ball of your foot to push the brake. The brake pedal is the position where you might be required to use the most force, should you lose power brakes. Without lifting or moving your heel, you should be able to rotate your ankle slightly to push the accelerator pedal with the ball of your foot. By not needing to re-position the heel of your foot when switching from acceleration to deceleration you can avoid the problem many people often have in a panic situation where they mash the accelerator instead of the brake. Your muscle memory can easily select brake or accelerator just by changing the angle of your foot. 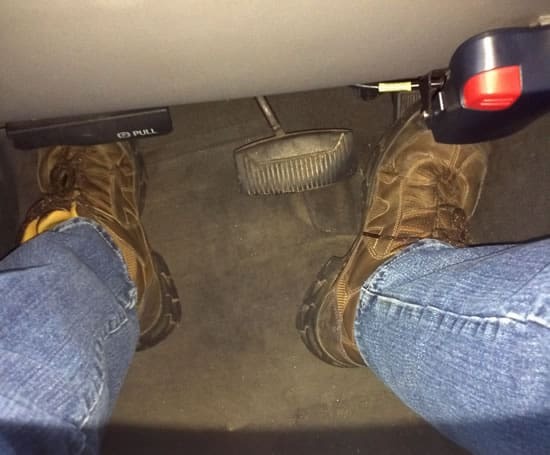 If you drive an automatic transmission, you may want to occasionally develop the technique to use both feet, one on the accelerator and the other on the brake. You have learned how to be aware of the hazards around you, how to position your body so you won’t fatigue, as well as maintain control during impacts. Now we will discuss strategies for putting your vehicle in a good position to react to hazards. The key component is strive to always keep several options open. Avoid boxing yourself in with traffic around you. I like to try to keep at least one lane (or a shoulder) open next me at all times. Also learn to avoid the blind spots of the vehicles around you as well. When on a roadway with 3+ lanes of traffic, avoid merging into a center lane while you are in the blind spot of someone on the opposite side of that lane – in case they decide to change into the same lane as you do. 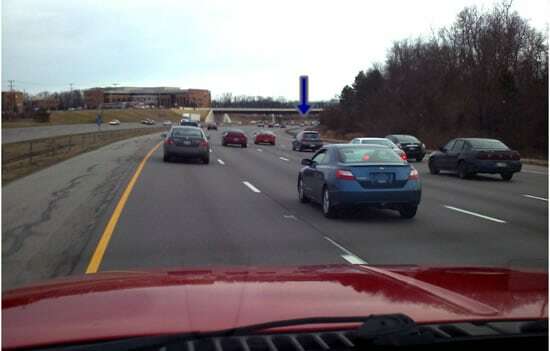 In this situation, I avoid changing lanes until I am at least a half car length in front of them. Occasionally while driving mentally think about “what if” scenarios in your head. Such as: “What if that 18-wheeler lost a wheel directly into my lane?” “What if a car runs that red light as I enter the intersection?” Doing these metnal exercises will help keep you mentally practiced at quickly assessing a hazard and taking the best available course or action. It will also teach you to keep more evasive options available for yourself in different scenarios. 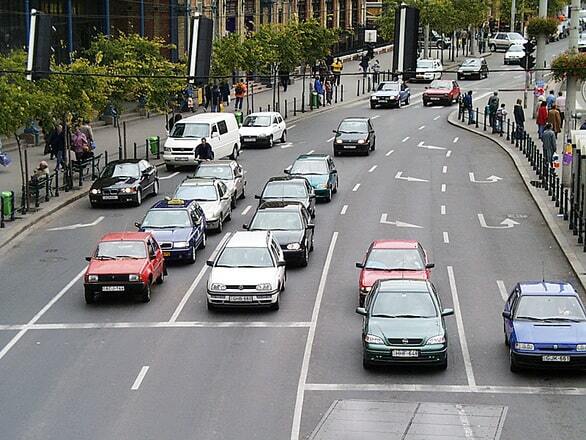 These strategies apply to city traffic just as much as they do the freeway. When pulling up to a red light, stop with enough space in front so that you could pull around the car in front of you if needed. Should someone attempt to mug you while sitting at the light your best option may be to simply (and quickly) pull off into the other lane. At the very least this would put the threat behind your car which is much more defensible than directly at your door. Remember should you ever need – when in the reasonable fear of your life, the vehicle itself can also serve as a very deadly weapon. Also remember that the brake is not the only option in a panic situation. Often times you can steer yourself out of near collision. If the vehicle is in a slide and it looks like you won’t be able to stop in time, the best solution may actually be to completely release the brake and then steer around the hazard. The front wheels cannot provide steering if they are not turning. This is unfortunately a very difficult thing to remember in a panic situation, and to overcome the natural reflex of locking up the brakes takes a lot of practice. Unfortunately few people have safe places to practice such maneuvers. I am of the opinion that public, and safe areas should be provided for drivers that wish to develop such skills. I personally believe the added safety these skills can develop outweigh the dangers of the practice itself. Snow filled, empty parking lots is one such way to practice emergency maneuvers and slide recovery at lower and safer speeds, however it is not legally condoned, and care should be taken to not damage others property. In summary, the key to well-rounded defensive driving habits are: Learn to be more aware of your surroundings. Learn good ergonomics and develop consistency to improve your driving skills and reflexes. And finally, practice driving techniques that keep your options open, and allow you to react to hazards as they present themselves. Do you recommend a driver observe the 3 or 4 second rule? More following distance equals more reaction time, so more is always good! It is hard to say how much you need as a general rule though, because conditions can be very different. Speed, good traction / vs slippery conditions, etc. can all change how much time you would need to react to an issue in front of you. Knowing your vehicle, how fast you can react, how alert you are, and how fast your vehicle will respond in the current conditions is really key. This comes from experience and practice! !